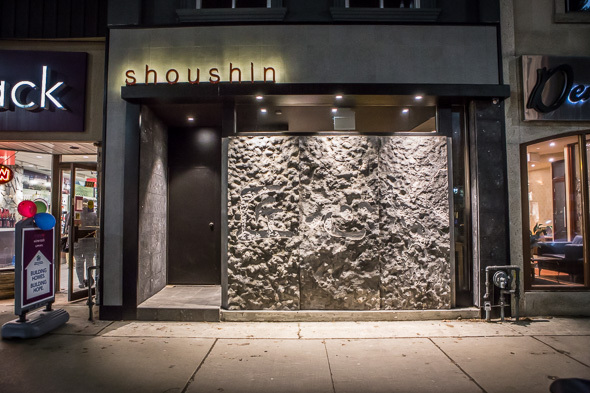 Shoushin is a sleek sushi bar in midtown that's reviving that ephemeral but personal relationship between itamae and diner. 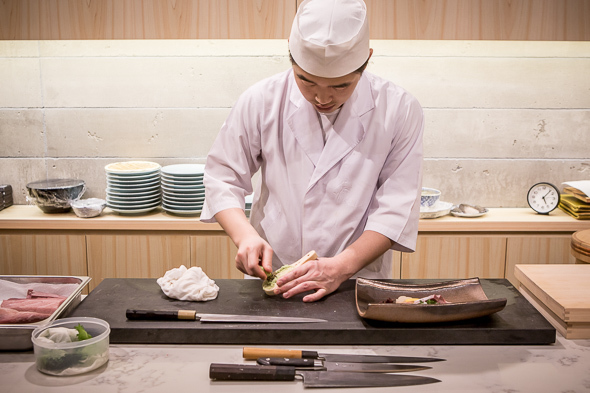 The sushi bar is the central focus and chef and owner Jackie Lin (formerly at Zen) is positioned upfront allowing sushi to be crafted and then consumed in just moments. I guess this is a shrine of sorts, a temple to traditional Tokyo style sushi if you will. The restaurant seats only 30 at a time, half of which benefit from Chef's personal attention at the bar. Two seating areas upfront require guests to trade their shoes in for slippers. The tables are low giving the impression that guests are sitting on the floor, but a sunken area underneath lets legs comfortably dangle over a bed of river rocks. 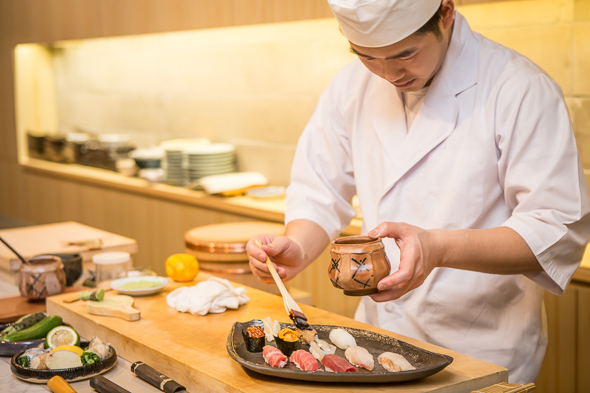 Omakase menus are designed in three sizes and price points; five courses for $80, six courses for $120, or seven course for $250. The upper tiers featuring increasingly lavish ingredients like fatty tuna, caviar and wagyu beef. The selection changes daily depending on what's fresh at the market - so much of it is imported from Tokyo Bay that the restaurant goes on hiatus the first week in January when suppliers shut down for national holidays in Japan. No matter which menu you select, the meal kicks off with a couple of appetizers. Soy milk skin wrapped around scallops and lobster are just one example. 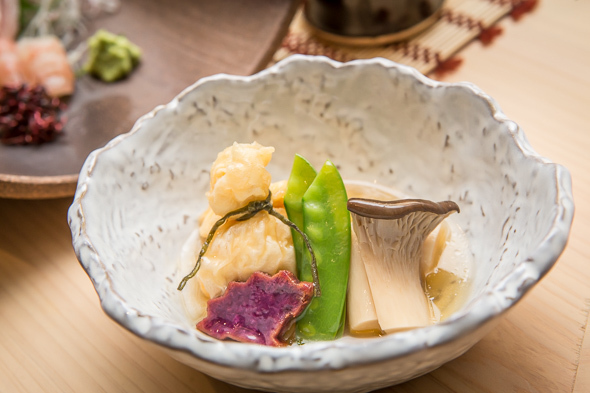 The dumplings are tied with sea kelp and paired with beautifully manicured sweet potatoes, king oyster mushrooms and snap peas in a sweet bonito broth. 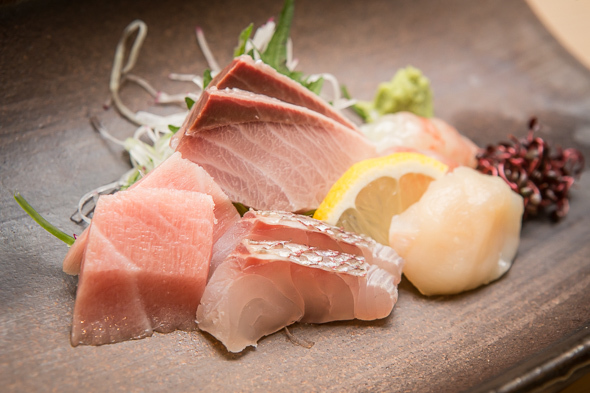 A sashimi course is included in the two top tier menus. 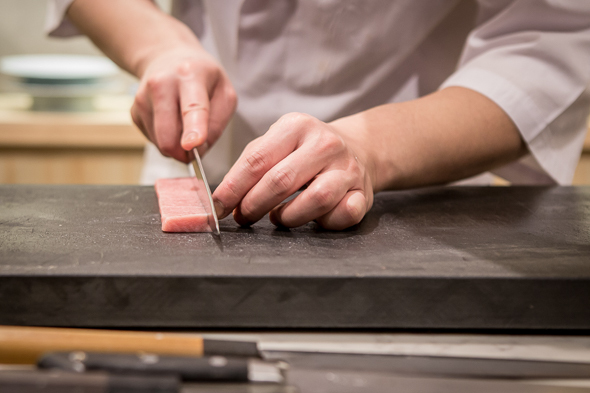 Today the precise display is a showcase of sweet spot prawns and scallops, delicately sliced sea bream, wild yellowtail and toro. Freshly grated wasabi and peppery micro benitade are simple but zingy garnishes. 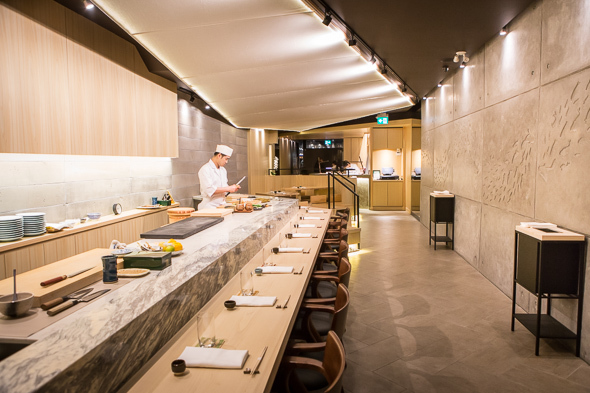 If you've managed to snag the prime seats at the sushi bar, the sushi course will be presented one piece at a time. You're meant to eat each nigiri immediately as it's set before you - never mind that convention where you wait for your whole party to be fed. Never mind your chopsticks either. Fingers are encouraged. At the tables the dish is presented on a platter, each piece of fish painted with soy sauce just moments before it's set down. Today I'm treated to three types of tuna showcasing an ombrĂŠ of lean to fatty cuts. 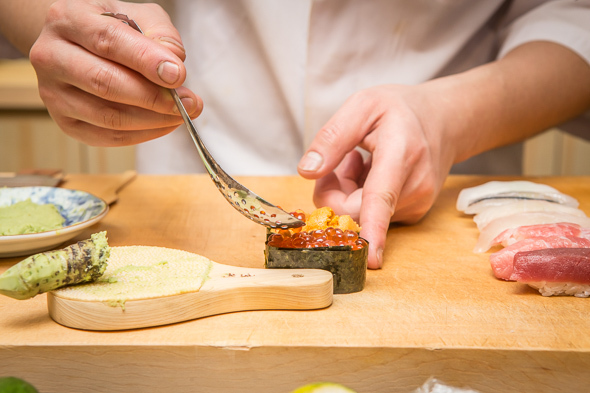 The plump pillow of sea urchin wrapped in seaweed is another standout, as is a roll overflowing with salmon roe sprinkled with yuzu zest. While the array of deluxe seafood easily impresses, the rice is notable too. In true Tokyo style, it's slightly sour and not nearly as sweet as the seasoning often is in Toronto. 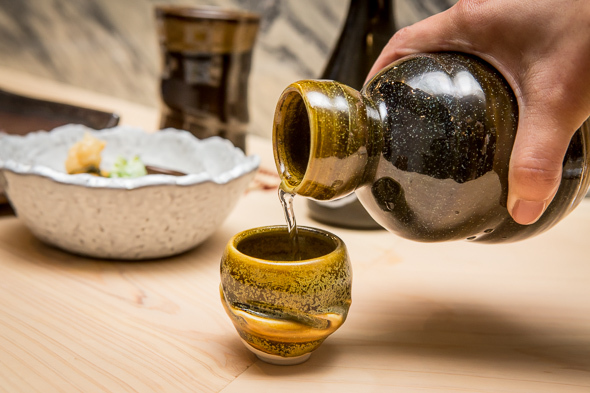 To drink there's bottles of sake ranging in price between $18 and $300 per bottle. Cocktails are nil, but there's Shochu ($11-$13), plum wine ($11-$12 per glass), and my personal fave, cans of Ikezo Peach Sparkling Jelly ($12). 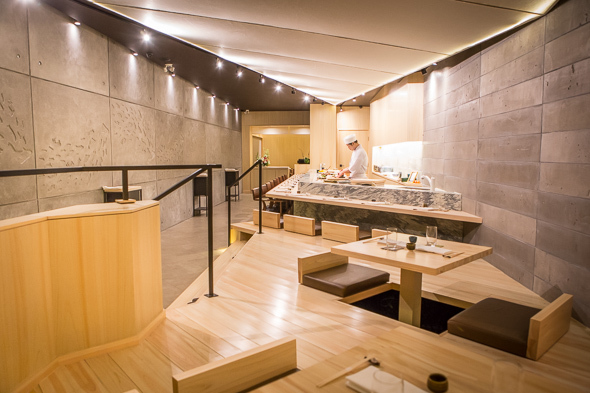 Walk ins are welcome but reservations are advised, especially if sitting at the sushi bar.